SymQuest Group, Inc., a wholly-owned subsidiary of Konica Minolta Business Solutions U.S.A., Inc., and regionally based IT and office technology provider, recently announced the addition of Calvin Waldron and Sue Bostock to its Operations and Finance teams respectively. Waldron joins SymQuest as a Shop Technician II, and Bostock as an Accounting Support Specialist. Waldron will be working out of SymQuest’s Plattsburgh, New York office with a focus on setting up document output products in the in-house shop. Prior to joining SymQuest, Waldron worked in landscaping and as a heavy equipment operator. “I am thrilled to join the team and learn more about Konica Minolta and SymQuest,” says Waldron. Bostock will be working out of SymQuest’s South Burlington, Vermont office supporting Accounts Receivable and Accounts Payable. Bostock brings over 30 years of experience in administration for the banking and investment industries. “I am excited to join the SymQuest Finance team,” Bostock says of her new role. SymQuest is currently seeking quality people to join its growing offices. To learn about our career opportunities in Northern New England visit www.SymQuest.com/Careers. Founded in 1996, SymQuest designs, installs, and hosts network infrastructures and printing environments of all sizes. SymQuest is a regionally based subsidiary of Konica Minolta Business Solutions U.S.A with locations in South Burlington and Rutland, VT, Plattsburgh and Watertown, NY, Keene and West Lebanon, NH and Westbrook and Lewiston, ME. SymQuest has developed a national reputation for service excellence and innovation and is ranked Northern New England’s #1 managed IT services and copier provider by MSPmentor©. Learn more about our solutions at www.SymQuest.com. Konica Minolta Business Solutions U.S.A., Inc. is reshaping and revolutionizing the Workplace of the Future™ (www.reshapework.com). With our comprehensive portfolio, we deliver solutions to leverage mobility, cloud services, and optimize business processes with workflow automation. Our All Covered IT Services division offers a range of IT strategy, support, and network security solutions across all verticals. Konica Minolta has been recognized as the #1 Brand for Customer Loyalty in the MFP Office Copier Market by Brand Keys for eleven consecutive years and is proud to be ranked on the Forbes 2017 America's Best Employers list. Konica Minolta, Inc. has been named to the Dow Jones Sustainability World Index for five years in a row. We partner with our customers to give shape to ideas and work to bring value to our society. For more information, please visit: www.CountOnKonicaMinolta.com and follow Konica Minolta on Facebook, YouTube, and Twitter@KonicaMinoltaUS. 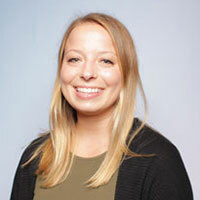 Katy DelGreco is a Marketing Assistant with SymQuest. DelGreco is responsible for internal corporate communications, event planning, and corporate social responsibility (CSR) initiatives across SymQuest's eight office locations.